Provide comfort for the family of Dwight Knutson with a meaningful gesture of sympathy. 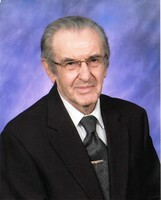 Dwight Harlan Knutson, 87, of Platte, SD passed away Saturday, January 19, 2019, at the Platte Care Center Avera. Funeral Services are 10:30 A.M. Thursday, January 24, 2019, at the First Reformed Church in Platte. A Committal Service will follow at Dunlap Memorial Cemetery. Visitation will be held at the church from 5:00 – 7:00 P.M. Wednesday, January 23, 2019, with a 7:00 P.M. Prayer Service. Dwight Harlan Knutson was born on December 11, 1931, to Oscar and Ethel (Munger) Knutson at their home in rural Platte, SD. He graduated from Platte High School in 1950 and began what was to be a lifelong love of the land through a career in farming. On June 7, 1956, Dwight was united in marriage to Clara Vander Tuin at the New Holland Christian Reformed Church. A passion for aviation led Dwight to earn his pilot’s license. He shared this enthusiasm through his model planes that were flown by a remote tethered to the plane with a steel cord. As a farmer and pilot, he was always mindful of the weather and storms, taking an interest in the clouds they produced. This, combined with his fondness for photography, led him to create an entire photo album of different clouds. Dwight was a member of the Platte First Reformed Church, but the Dunlap Church and Memorial Cemetery always held a special place in his heart. It was his honor to help restore and maintain the church and cemetery grounds. Grateful for having shared in Dwight’s life: his wife of over 62 years, Clara Knutson of Platte, SD; three children: Craig (Janet) Knutson of Mitchell, SD, Kimberly (Randy) Van Zee of Lake Worth, FL and Loren (Brenda) Knutson of Prosper, TX; 11 grandchildren: Jeremy (Amber) Knutson, Matthew Knutson, Nichole (Jon) Basel, Luke Knutson, Nathan Van Zee, Jonathan Van Zee, Michael Van Zee, Nicholas Van Zee, Alec Knutson, Jaeden Knutson and Marina Knutson; two great grandchildren: Aria and Levi Basel; a brother-in-law, Dale Munger of Platte, SD; nieces and nephews: Berneice (Kenneth) Gifford of Rapid City, SD, Arlan (Jean) Knutson of Fallbrook, CA, Michael Munger of Platte, SD, Marshall (Vanessa) Munger of Pukwana, SD, Heidi (Kevin) Mendenhal of Mitchell, SD and Gretchen Munger of Mitchell, SD; three cousins, Jean Miller, Marvis Miller and Janet Beukelman all of Mitchell, SD; along with classmate and lifelong friend, Gene Ninnemann. Dwight was preceded in death by his parents, Oscar and Ethel Knutson; a brother, Howard (Deva) Knutson; a sister, Esther (Benton) Buttrey; mother and father-in-law, Albert and Sadie Vander Tuin; a brother-in-law, Marlin Vander Tuin; and a sister-in-law, Judy Munger. Memorials in Dwight’s honor may be directed to: Dunlap Church and Memorial Cemetery, c/o Clara Knutson, 26491 368th Ave., Platte, SD 57369 or First Reformed Church, PO Box 418, Platte, SD 57369. 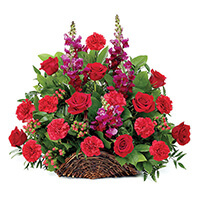 To send flowers in memory of Dwight Harlan Knutson, please visit our Heartfelt Sympathies Store. To the Knutson family and friends please accept my deepest condolences for the loss of your loved one Dwight. Very soon Jesus Christ will resurrect the loved ones we have lost in death back to life Acts 24:15; John 5:28, 29, right here on a brand new Paradise Earth no more sickness pain or death Life Without End Revelation 21:1-5 jw.org. Civil Design Professionals purchased the CLASSIC FIRESIDE SYMPATHY BASKET for the family of Dwight Knutson. Thinking of you. May he Rest in Peace. 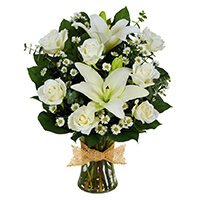 Carol Hloucha purchased the Tribute Mixed Vase Arrangement - All White for the family of Dwight Knutson. Craig, Janet & family, We are so very sorry to hear of your loss! May the good Lord wrap his loving arms around all of you and give you strength, comfort and peace! Keeping you in our thoughts & prayers!